London Pride is an iconic pint. And if it ain't broke, don't fix it, they say. 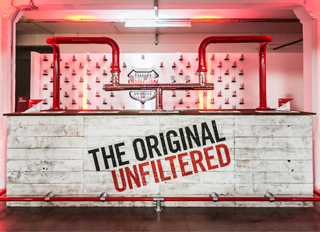 At our biggest beer launch in a generation, we recently revealed London Pride Unfiltered. We’ve brewed a new beer. While most keg beers are filtered and pasteurised, London Pride Unfiltered is processed as little as possible, so that it retains as much of its natural flavour as possible. Brewed to the same recipe as London Pride Original, we dry hop for added character, serve it cold for added refreshment, and unfiltered for added flavour. London Pride Unfiltered is still brewed with Northdown, Challenger, Target and Goldings hops, then dry hopped with Northdown and Challenger again for a bold, contemporary flavour. While the recipe hasn't changed, London Filtered is not to be confused with London Pride Original. Served at 4.1% ABV from keg - with a hazy body and a sharp, clean flavour - we expect drinkers who are interested in trying craft beers to enjoy London Pride Unfiltered. We still brew London Pride in cask, as we always have. London Pride Unfiltered won't be pushing cask London Pride Original off any bars, as they will be available in a slightly different style of pub and bar than you can expect to spot London Pride Original. Let John Keeling, the undisputed heavyweight champion of craft brewing, tell you more about the newest beer to come out of the Griffin Brewery.